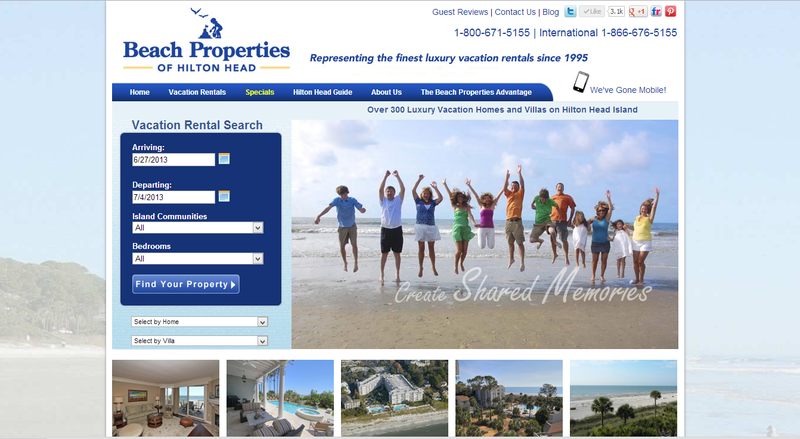 Beach Properties of Hilton Head's website simply offers guests the fastest and easiest way to book a vacation rental online. What does it take to become of one of the best vacation rental management companies in the United States? Hard Work. Dedication. And an unwavering commitment to excellent customer service. That’s the approach Beach Properties of Hilton Head took. And the results are undeniable. Since its founding in 1995, Beach Properties has grown to manage more than 300 properties on the beautiful island of Hilton Head in South Carolina. Their website receives more than 800,000 visitors a year. Last year they were named Small Business of the Year by the Hilton Head – Bluffton Chamber of Commerce. And, just yesterday it was announced that have been voted the No. 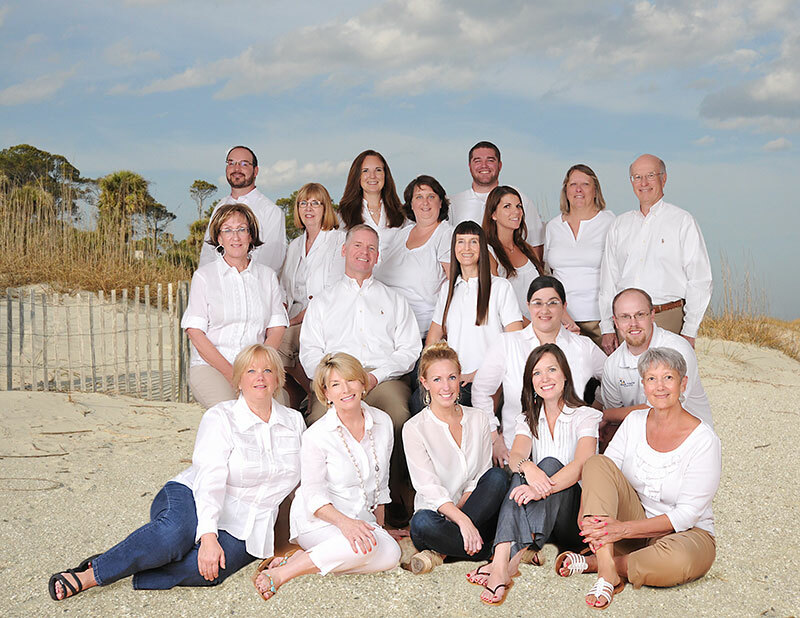 1 vacation rental company on Hilton Head for the fourth straight year. But, perhaps the biggest indication of their success are the guests that come back year after year and the vacation home owners that have entrusted their homes to Beach Properties for years. For Marketing Manager Meg Park, the company’s success really boils down to service. According to Park, every single member of their staff is trained to make customer service their No. 1 priority. Beach Properties truly takes customer service to another level. They seem to have every step of the guest experience nailed. It starts with a robust marketing program that generates more than 800,000 visitors to the company website each year. When travelers get to Beach Properties’ stunning website, they simply find the easiest way to search for and book a vacation property online. If travelers have questions or want to book over the phone, they will be greeted by a highly-trained vacation planner in three rings or less. Prior to arrival, Beach Properties mails out custom arrival packets to all of its guests that include keys (or keyless entry codes), car passes, maps / directions, and any other information pertinent to a guest’s arrival. When guests arrive, they can choose to bypass the check-in office and head straight to the property if they wish, thanks to Beach Property’s Express Check-In. If a guest has a problem on their stay and needs help, the company employs eight on-site, South Carolina licensed property managers. And, when it’s time to head home, Beach Properties religiously collects ratings and reviews from their guests in an effort to continuously provide guests with an exceptional experience. If that’s not enough, Beach Properties has partnered with local businesses to provide guests with an extensive variety of discounts. Currently, Beach Properties has more than 125 local businesses that participate in their Preferred Guest Discount Program. Every guest that rents from Beach Properties receives a laminated card and two key tags, which they can show to local businesses and get a wide variety of discounts. It’s a win-win situation for both guests and neighboring businesses on the island. Guests get access to incredible deals and local merchants get an influx of business. The three-year old program grows by about 15-20 businesses every year, Park said – a fact made all the more impressive when you know how carefully Beach Properties vets the businesses they add to the program. The company’s owner services are also top of the line. Vacation rental owners certainly have no problem getting their property noticed by travelers, thanks to Beach Property’s extensive marketing program. And engages in a wide variety of print ads. They even throw in professional photography services at no extra charge to the owner. The level of home care they offer owners is also exceptional. When you couple the exposure of Beach Properties’ marketing efforts with this level of home care (and their exceptional guest services), it’s no wonder that many owners have stayed with the company a decade or longer. Hilton Head is simply one of the most beautiful beach destinations in all of North America. And that’s thanks in large part to its developer, Charles Fraser. The Yale Law School graduate had a strong vision for the island. He wanted to bring people to this stunning locale while preserving the natural beauty of it for many generations to come. Fraser’s dream of sustainable development is alive and well in Hilton Head. Despite being one of the most popular destinations for vacation rental in the United States, the island maintains a secluded, old-fashion feel. It’s truly a place where someone can unplug and connect with nature. The name says it all. Beach Properties specializes exclusively in luxury properties that are directly on the beach or within a very short walk. The company’s inventory of 300+ units ranges from one-bedroom to seven-bedroom homes and villas that are either directly on the beach or within a few minutes’ walk to the beach. Much of the island’s year-round residents live on the north end of the island, so Beach Properties focuses mainly on the south end of the island where most of the tourist activities take place. And within that south end, they focus primarily on three communities: Forest Beach, Palmetto Dunes and Sea Pines (the original community established by Fraser and the island’s most well-known). By focusing on these neighboring communities, Beach Properties can respond to guests’ and owners’ needs with incredible speed. 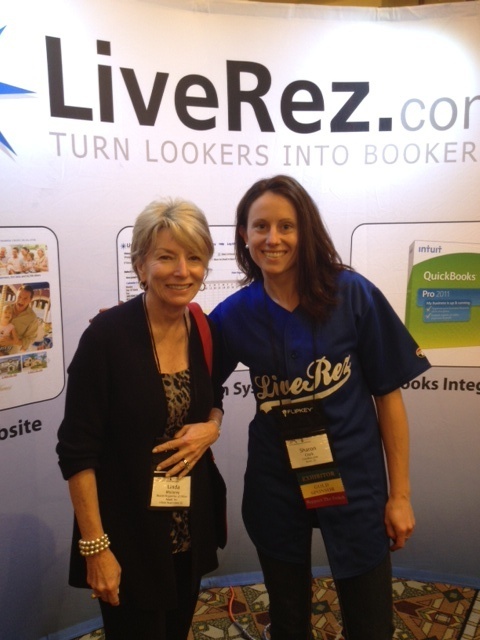 Beach Properties owner Linda Moloney with LiveRez director of partner success Sharon Clark at the 2012 VRMA National Conference. One thing that Beach Properties is always striving for is to stay current with the latest trends and technology. And last year, when Beach Properties was looking at upgrading their vacation rental management software, they were looking for a company that shared those values. Park said the major thing that attracted them to LiveRez was that the company was constantly improving its software based on changing industry needs and the suggestions of its partners. Even though Beach Properties is a well-established company, they are always changing and growing. And, it was important to them to partner with a company that is doing the same. Another thing that Park said was important was the company’s reputation. Since switching to LiveRez, Park has found value in many of the features the software provides. And, of course, she’s the first to jump on the new updates, which come out nearly every week. With LiveRez’s help, the company just rolled out a mobile website to cater to the increasing percentage of guests accessing their website with mobile devices. But, pressed to pick a favorite feature, Park did not hesitate. She chose the LiveRez CRM system, a powerful tool for automating and tracking a company’s communications with guests, owners and prospects. It’s not so surprising that Park would choose the “Customer Relationship Management” system as her favorite. She does work for an industry leader, who built its business from the ground up on the simple premise of amazing customer service!